One of the goals of biomimetics is to take inspiration from the functioning of the brain [also known as neuromorphic engineering or neuromorphic computing] in order to design increasingly intelligent machines. This principle is already at work in information technology, in the form of the algorithms used for completing certain tasks, such as image recognition; this, for instance, is what Facebook uses to identify photos. However, the procedure consumes a lot of energy. 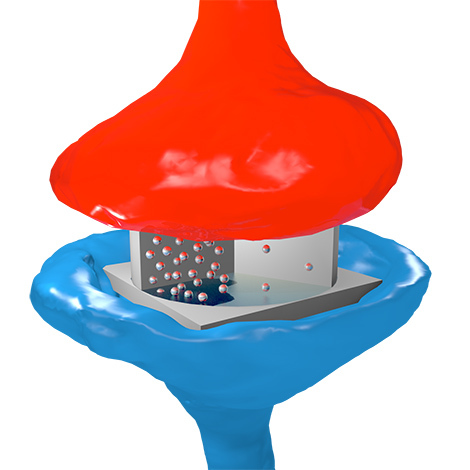 Vincent Garcia (Unité mixte de physique CNRS/Thales) and his colleagues have just taken a step forward in this area by creating directly on a chip an artificial synapse that is capable of learning. They have also developed a physical model that explains this learning capacity. This discovery opens the way to creating a network of synapses and hence intelligent systems requiring less time and energy. Our brain’s learning process is linked to our synapses, which serve as connections between our neurons. The more the synapse is stimulated, the more the connection is reinforced and learning improved. Researchers took inspiration from this mechanism to design an artificial synapse, called a memristor. This electronic nanocomponent consists of a thin ferroelectric layer sandwiched between two electrodes, and whose resistance can be tuned using voltage pulses similar to those in neurons. If the resistance is low the synaptic connection will be strong, and if the resistance is high the connection will be weak. This capacity to adapt its resistance enables the synapse to learn. Although research focusing on these artificial synapses is central to the concerns of many laboratories, the functioning of these devices remained largely unknown. The researchers have succeeded, for the first time, in developing a physical model able to predict how they function. This understanding of the process will make it possible to create more complex systems, such as a series of artificial neurons interconnected by these memristors. As part of the ULPEC H2020 European project, this discovery will be used for real-time shape recognition using an innovative camera1 : the pixels remain inactive, except when they see a change in the angle of vision. The data processing procedure will require less energy, and will take less time to detect the selected objects. The research involved teams from the CNRS/Thales physics joint research unit, the Laboratoire de l’intégration du matériau au système (CNRS/Université de Bordeaux/Bordeaux INP), the University of Arkansas (US), the Centre de nanosciences et nanotechnologies (CNRS/Université Paris-Sud), the Université d’Evry, and Thales. © Sören Boyn / CNRS/Thales physics joint research unit. Artist’s impression of the electronic synapse: the particles represent electrons circulating through oxide, by analogy with neurotransmitters in biological synapses. The flow of electrons depends on the oxide’s ferroelectric domain structure, which is controlled by electric voltage pulses. Thales Group (French: [talɛs]) is a French multinational company that designs and builds electrical systems and provides services for the aerospace, defence, transportation and security markets. Its headquarters are in La Défense (the business district of Paris), and its stock is listed on the Euronext Paris. The company changed its name to Thales (from the Greek philosopher Thales, pronounced [talɛs] reflecting its pronunciation in French) from Thomson-CSF in December 2000 shortly after the £1.3 billion acquisition of Racal Electronics plc, a UK defence electronics group. It is partially state-owned by the French government, and has operations in more than 56 countries. It has 64,000 employees and generated €14.9 billion in revenues in 2016. The Group is ranked as the 475th largest company in the world by Fortune 500 Global. It is also the 10th largest defence contractor in the world and 55% of its total sales are military sales. Thales of Miletus (/ˈθeɪliːz/; Greek: Θαλῆς (ὁ Μῑλήσιος), Thalēs; c. 624 – c. 546 BC) was a pre-Socratic Greek/Phoenician philosopher, mathematician and astronomer from Miletus in Asia Minor (present-day Milet in Turkey). He was one of the Seven Sages of Greece. Many, most notably Aristotle, regard him as the first philosopher in the Greek tradition, and he is otherwise historically recognized as the first individual in Western civilization known to have entertained and engaged in scientific philosophy. This entry was posted in electronics, military, nanotechnology and tagged advanced vision applications, Agnès Barthélémy, and Thales (Group), artificial brain, artificial synapse, Bin Xu, biomimetics, Cécile Carrétéro, Centre de nanosciences et nanotechnologies (CNRS/Université Paris-Sud), Centre National de la Recherche Scientifique (CNRS), CNRS, CNRS/Thales physics joint research unit, electrodes, electronic synapse, France, Greek philosopher, Gwendal Lecerf, H2020, Horizon 2020, human brain, intelligent machines, Jean Tomas, Julie Grollier, Karin Garcia, Laboratoire de l'intégration du matériau au système (CNRS/Université de Bordeaux/Bordeaux INP), Laurent Bellaiche, learning, learning autonomously, Learning through ferroelectric domain dynamics in solid-state synapses, Manuel Bibes, memristor, neuromorphic computing, neuromorphic engineering, neuromorphic event-based camera, neurons, neurotransmitters, Nicolas Locatelli, Racal Electronics, real-time shape recognition, Sören Boyn, Spiking Neural Network with memristive synapses, Stéphane Fusil, Stéphane Xavier, Stéphanie Girod, Sylvain Saïghi, Thales, Thales of Miletus, Thomson-CSF, ULPEC H2020 European project, Ultra-Low Power Event-Based Camera (ULPEC), Université d'Evry, University of Arkansas, University of Arkansas (US), University of Bordeaux, University of Evry, University of Paris-Sud, US, Vincent Garcia on May 2, 2017 by Maryse de la Giroday.